Surprisingly, Punakha hosts some fine luxury living options and some really good 3 star accommodation options. Its difficult to find backpacker style accommodation in Punakha and most hotels which are not five star will only take cash. Punakha is a place with great natural beauty so it's highly recommended that you look for a hotel which offers you the best value in terms of views and experiential living. Dhensa Boutique Resorts is situated in the centre of the Rice bowls of Punakha and it directly overlooks the Punakha Chu (river). There are many popular trekking trials and pathways around Dhensa Resorts. It is possible to trek up to Sangchhen Lhuendrup Lhakhang Nunnery within 10 minutes from the resort. The resort reflects an amalgamation of ancient Bhutanese architecture and modern luxury. There are 24 suites which are divided into 6 cottages (all have private balconies). All suites have attached ultra-luxury washrooms with marble bathtubs and French window dusks. All guests of the Dhensa Boutique resorts can access the extensive Dhensa library and the free wi-fi. There is also an in-house spa and beauty treatment center. The room tariff per day is between 21,349 NU to 11,329 NU and there is a 10% discount available on off season. 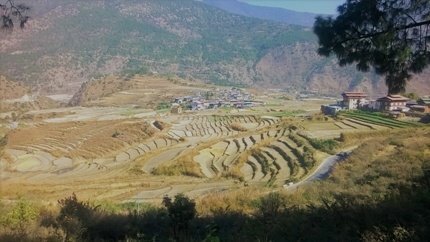 Sopsokha, Near Chimi Lhakhang temple, Punakha. The RKPO green resort is roof carpeted all over with lush cultured grass beds giving it a restful luxuriant atmosphere. The rooms are very well equipped and most with beautiful views. However, this hotel doesn’t have an in-house gym and that is a little disappointing for a hotel of this cadre. The in-house bar is named “Phallus bar” and in season times music and dance performances are organized on the lawns. You can look for a room on the left portion of the hotel as the views are even more beautiful. The staff are very friendly and this is a nice accommodation option if you don’t mind staying a little far away from the Punakha market (20 minutes). Room tariff per night is 9734 NU and the menu options are a little pricey. COMO UMA Punakha is an ultra-luxurious 5-star resort situated at the western side of the beautiful Punakha valley. The hotel is in the nook of the Mo Chu river and represents an ideal position from where adventure lovers, ornithologists, naturalists and hikers can explore the remote and beautiful Himalayan Kingdom. All the rooms of the resort command stunning views of the orchards and the rice fields along with the splendid Himalayan Vista. There are 3 kinds of accommodation options in UMA Punakha. Valley View rooms, one bedroom villas and the signature 2 bedroom COMO Villa. The Room tariff per day ranges from 26,742 to 53,483 NU. There are 11 rooms in total. Guests can avail the luxury restaurant (Bukhari) and the Wellness Spa “Shambala” which offers some of the most luxurious body care treatments in Bhutan. This hotel is in Lobesa village which is a few kilometres away from Punakha. Hotel Lobesa has earned the reputation of being the best 3-star boutique property in the Punakha valley despite being rather new on the Bhutan hospitality map. 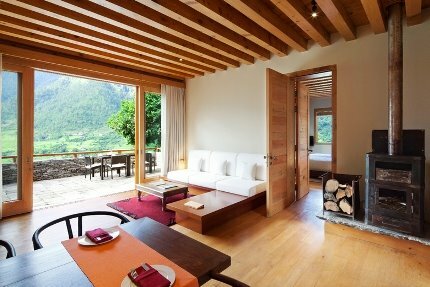 The rooms are huge and all of them have stunning views of the Punakha Valley. The washrooms are huge though some of them do not have heaters. There is an in-house massage service in the hotel and there is a travel desk which will arrange hiking and sightseeing trips. From most of the rooms, you will be able to see luxuriant rice fields. This hotel is not really in Punakha but is located en route between Thimphu to Punakha (about 31kms from Thimphu) and you can stay here for a day if you want to soak in the magnificent beauty of Dro Chu La Pass. Every room in the hotel will give you a splendid view of the Himalayan Vista. Many tourists stay back here for a night to enjoy the views and the birdlife around. At an altitude of around 3150 m above sea level, the hotel is going to be very cold on most times of the year. All rooms have electric blankets, room heaters and a high-powered geyser (takes 40 minutes for the water to heat up though). In the winters you may face the issue of frozen water pipes. There is a nice in house restaurant serving Indian and Chinese cuisine and a bar along with wi-fi (though that doesn’t work most of the time). There is also an in-house gift store where you can find handicraft items made by the owner himself - the scroll paintings (Thangkas) are wonderful. The room tariff per night is 4500 NU per night (rates vary seasonally). The location of this hotel is amazing as its perched-on top of a quaint little hillock. Most ornithologists prefer to stay at this hotel because of its great bird watching opportunities. The staff of the hotel are nice and friendly and the rooms are comfortable and spacious. The selling point of the hotel is its beautiful attached balconies that provide stunning views. Food quality of the in-house restaurant seems to be nothing extra-ordinary but you can always try out other dining options. There is business centre and a foreign currency exchange centre in the hotel. There are 19 rooms in this hotel. Tariff per night is around 3560 NU. This is one of the most reasonably priced hotels in Punakha that offer great accommodation option coupled with stunning views. You can see the river and hill from almost every room. Incidentally, the rooms are very huge…so huge in fact that they are unable to benefit much from the rather weak room heaters inside. Amenities are quite basic though there is free good speed wi-fi. Food served is nice though it’s mostly Indian and Bhutanese choices. Room Tariff per night is 3042 NU (approx.). There are 51 rooms in the hotel.